Spring is a beautiful season when nature looks amazing and the weather prepares us for a change. The days tend to the warm while the nights are slightly cold. One of the many festivals of India that celebrates Spring is Gudi Padwa. This festival marks the New Year for Marathi Hindus. People in Maharashtra celebrate this special day with Rangoli – vivacious floor decoration, Gudhi Flag – garlanded with flowers, mangoes, neem leaves, and upturned silver/copper vessels, street processions, lip-smacking food, dance and Gudi Padwa gifts. It is celebrated on the first day of a lunar fortnight and this year it is on 6th April 2019. A Gudi or Gudi is an erect flag made from a long bamboo and a bright colorful silk scarf. The bamboo is covered with this scarf and on top of it neem leaves, mango leaves, and a garland of flowers are attached. This whole arrangement is capped with a silver or copper inverted vessel and this signifies victory of good over evil. This arrangement saves the household from all evils. You will see this bright Gudi outside every household generally to the right. Gudi Padwa or Gudi Padva festival signifies the arrival of spring season and reaping of the Rabi crops. As per Anne Feldhaus, in rural Maharashtra, this Gudi Padwa festival is linked to Lord Shiva’s dance and coming together of the community as they carry the Gudhi Kavads together to the nearest Lord Shiva temple. The word “Gudi or Gudhi” refers to an erect flag on the houses. The word “Padwa” has its origin in the Sanskrit word “Pratipad”. It refers to the first day after the full moon. 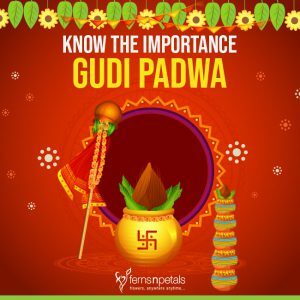 Gudi Padwa is also linked with the Hindu God Brahma. As per the Brahma Purana, it is said that he started creating time and universe on this day. Some believers say that this day observes the coronation of Lord Rama in Ayodhya after his stupendous victory over evil Ravana. It was on Gudi Padwa that the Shaka calendar began in 78 A.D. It was this day that Gautamiputra Satakarni of the Shalivahan dynasty defeated the Sakas. Did you know that Gudi Padwa falls on one of the three and a half auspicious days of the bright phase of the moon? Gudi Padva symbolizes the love between a husband and wife. The mother of the newlywed women invites the couple for a nice lunch. Farmers believe that this is a lucky day to begin sowing seeds. This festival is also often considered a prequel or even a pre-evolved form of Holi.